In Zui hao de shi guang (Three Times, 2005), Hou Hsiao-hsien reprises the observational, long-take aesthetic that has distinguished his work at home and on the festival circuit since the mid-1980s. Comprised of three shorts, each set in a different moment in 20th century Taiwan, the film offers an overview – if not a reflexive stock-taking – of Hou’s practice to date. The first segment, “A Time for Love,” recalls Lianlian fengchen (Dust in the Wind,1986) and its delicate interplay of sequence shots and elliptical edits; part two, “A Time for Freedom,” bears an immediate relation to Hai shang hua (Flowers of Shanghai,1998) with its roving camera and congested mise en scène; and part three, “A Time for Youth,” returns to Qianxi manbo’s (Millennium Mambo, 2001) equally congested depiction of aimless twentysomethings in modern Taipei. Hou’s supporters – those who have never bought the argument that he revels in an aestheticism that simply ignores the pleasures of film viewing – have long noted his ability to refine his signature style without repeating himself. To be sure, Three Times marks out some new directions for Hou, but its intertextuality within his own corpus all but demands a reassessment of his uncommon approach. In the case of Hou, these aims led to a preference for long takes and telephoto lensing, an approach which mobilized his explorations of national history. Longer lenses (75mm-150mm) with “faster” registration rates were already in regular use in the popular Taiwanese film industry, as they presented fewer compositional problems for filmmakers shooting on tight budgets. In Hou’s hands, however, the telephoto lens became a tool for catching history in the process of its becoming, for isolating (and ignoring) revelatory moments in the crowded frame. The lifting of martial law in 1987 permitted Hou to set his sights on previously unexplored histories, and in Beiqing chengshi (City of Sadness,1989) he broached the “February 28 incident” (the 1947 massacre in Taipei of thousands of civilians at the hands of KMT soldiers) with remarkable acuity. Instead of covering the event in broad strokes, Hou staged most of the violence offscreen and worked on a microscopic scale, registering its impact on a particular family. (3) City of Sadness received the Golden Lion at the Venice International Film Festival and established Hou as a major figure in world cinema, but in Taiwan, despite its enormous success at the box office, the film gradually divided Hou’s viewers into “pro-Hou” and “anti-Hou” factions, the latter group claiming that he should have shown the incident more explicitly and exposed the whitewashing of the Nationalist government. Since then, Hou has remained a controversial figure among local audiences, whose steady gravitation toward Hollywood offerings has contributed to a domestic market in which Chinese films make up a negligible 2.5 percent. (4) In 1991, a group of local critics put together a collection of essays titled Death of the New Cinema, and all of them pointed fingers at Hou and his distant observationalism. (5) But whether he stands accused of formalist tedium or conservative politics (a position that gained support when he filmed a music video for the Ministry of Defense), (6) the debates concerning Hou inevitably turn on questions of style and realism and temporality. What always seems at issue are his long-held shots and his persistent avoidance of Western codes of cinema. Much has been written in the effort to pinpoint the cultural specificity of Hou’s shooting style, with critics often citing traditions of Chinese painting and theater. But as David Bordwell maintains in his analysis of the director, Hou’s aesthetic originated as a rather practical response to the working conditions of the Taiwanese industry in the late 1970s and early 1980s. Long-lens filming enabled Hou not only to limit the number of camera setups but to shoot his inexperienced actors from much greater distances, thereby obtaining more subtle performances. “He became a long-take director,” Bordwell writes, “because he sought to refine performance by capitalizing on craft practices [that were] already normalized in his commercial milieu.” (7) Hou indeed seems an exemplary figure for Bordwell’s craft-centered “historical poetics,” an approach which stresses the impact of aesthetic norms on filmmakers’ choices at the moment of shooting, and which assumes implicitly that other, more theoretically-intensive approaches move too quickly between aesthetic and cultural registers. (8) It doesn’t take Bordwell very long to cite Hou’s typical remarks in interviews that his first step is always to impose limits and restrict his options. Nor does Bordwell hesitate to mention that Hou – unlike Edward Yang and some of the other Taiwanese repatriates who studied film in the West and were introduced to Robert Bresson, Jean-Luc Godard, and Michelangelo Antonioni – had little film-historical knowledge to draw on in cultivating his approach. (9) Seen from this angle, Hou’s style appears incredibly modest, less a product of cinematic convention than of intuitive problem solving. Jones seeks to rescue Hou from the charge of arthouse indulgence, his point being that such a claim privileges the action-oriented style of Western (if not American) cinema and neglects the relevance of Hou’s work at this critical juncture in the history of image making. In what follows, I want to elaborate this position still further, looking at Three Times, its temporal registers and its implications for spectatorship. By drawing attention to what I am calling Hou’s optics of ephemerality, I intend to show more precisely what is at stake in his meditative practice. My purpose is neither to denationalize Hou’s work nor to subsume it under the heading of “world cinema,” but rather to tease out the aspects of his practice that speak in pertinent ways to the status and conditions of the image now. Set in Kaohsiung in 1966, the first chapter of Three Times begins with an image of an unlit ceiling lamp framed against an out-of-focus background. After lingering on this Ozu-like “still life” for a few seconds, the camera descends into a field of action as The Platters’ “Smoke Gets in Your Eyes” plays on the audio track. A rack-focus reveals May (Shu Qi), the female protagonist. She leaves the frame and we slide horizontally to the other principal character, Chen (Chang Chen), as he leans over a pool table and takes a shot. Given Hou’s stubborn restraint, it is hard to imagine a more loving introduction of his performers – in this case, two stars who are immediately recognizable to Chinese audiences. But the camera soon tires of watching these stunningly-lit figures; instead, it follows the path of a pool ball that loses speed and reaches a halt, colliding gently with another ball. In this gesture, Hou sets bodies and objects, characters and mise en scène, on equal footing. From the very beginning, he alerts the viewer to the fact that anything within the shot (or just outside its parameters) is worthy of intense scrutiny and capable of prompting camera movement. The scene continues, with the two main characters and Chen’s opponent moving sporadically in and out of focus. In a span of just under three minutes, there is no dialogue, only one edit (a jump cut), and the camera covers no more than a six-foot radius. “A Time for Love” thus begins by asserting the aesthetic postures of Hou’s most recent work: a packed frame, variable focal points, and a drifting camera. Ostensibly this scene sets up a narrative in which Chen, on leave from military service, tries to track down and reunite with May, a pool hall hostess. Less a prelude than a dream, however, the scene offers events that could not (or at least not likely) take place within the story’s chronology. For when Chen, after scouring the pool halls of Taiwan, finally catches up with May, she is working in a completely different location. 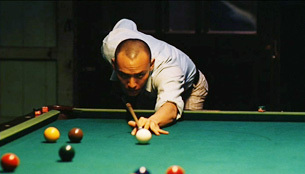 Still, the scene has a distinct autobiographical resonance for Hou, who comments: “I used to love to play pool when I was young, and I have a memory fragment of the song ‘Smoke Gets in Your Eyes’ always playing in the pool hall. Now I’m pushing sixty, and these things have been hanging around for so long it seems like they’re part of me. Maybe the only way I can discharge my debt to them is to film them.” (14) In this manner, Hou does more than nostalgically evoke an era; he creates a “memory fragment” with uncertain referents, an image of the past that is scarcely reducible to plot development. In keeping with Hou’s nostalgia, “A Time for Love” engages a particular moment in Taiwan’s history. By 1966, the island was experiencing remarkable economic growth, ideologically participating in Cold War politics, and serving as a short-term military base for the U.S. during the Vietnam war. The pool halls and English-language pop tunes that figure so prominently in the film were part of the rapid influx of American culture and its Westernizing discourses. Yet Hou, in characteristic form, opts not to address explicitly this history and its ramifications. Instead, he dwells on the rhythms of the quotidian, the chores and activities of daily life, such as May opening and closing the pool hall, or she and Chen sharing a meal. Here as always in his work, he displays an “anthropological interest” in examining the intricacies of “real-time behavioral processes.” (15) He tries to make these intricacies all the more traceable by repeating similar compositions and each time urging the spectator to notice subtle differences. (16) Throughout “A Time For Love,” Hou stages action, mostly pool playing, in front of doorways, interframing his actors but also underlining the division of interior and exterior space. The outside is often filmed in soft focus or rendered opaque with cigarette smoke. Not unlike his offscreen staging of historical events in City of Sadness, here Hou ruminates on windows and doorways as the spaces through which (official) history impinges on daily existence. If in the earlier film these thresholds set off a private sphere in which political realities can be discussed under the radar of the KMT, in “A Time for Love” they delimit a space in which time is slowed and suspended, in which locals and drifters can seek respite from the whirlwind of social change occurring just outside. Philip Lopate has likened Hou’s practice to Andy Warhol’s on account of its lingering attention to “dead time” and to seeming minutiae. (17) But where Warhol caters to glance (rather than gaze) aesthetics, inviting the viewer to watch distractedly in brief intervals, (18) Hou’s telephoto lensing and roaming camera work to intensify certain areas of the image and call for an almost clinical mode of engagement. Not to suggest that Hou orchestrates perception in the manner that, say, Alfred Hitchcock zeroes in on a folded newspaper or pushes across a crowded dance floor to rest on an extreme closeup of a drummer’s blinking eyes. For Hou is just as likely to obscure the most significant details, whether by staging them near or outside the borders of the frame, by depicting them in blurred focus, or, as David Bordwell has illustrated, by “bath[ing] many of the most important scenes in darkness.” (19) I would argue that these techniques make up Hou’s most significant deviations from the norms of Western cinema (notwithstanding his avoidance of shot/countershot, matches on action and other aspects of continuous screen direction). For example, in Hollywood production contexts since the arrival of television and spectator-oriented technologies, filmmakers have increasingly had to negotiate a “safe action zone” within the squarish parameters of a TV screen or computer monitor. (20) But Hou’s practice greatly opposes this centering of action and spectacle, a tendency which Bazin long ago regarded as too “centripetal” for the cinema. Hou’s framings, in some ways like Ozu’s before him, are rather more centrifugal in the sense that they destabilize the image and point up a world beyond the shot. (21) By offering neither a bulls-eye on which to concentrate, nor a deeply focused image that permits the viewer to scan the entire frame and decide what is most interesting (the stock-in-trade of Jean Renoir and other long-take directors), Hou thematizes the difficulties of seeing. For Hou, vision cannot be taken as given; it must be achieved. It does seem possible to theorize Hou’s aesthetic in relation to the time-image, using Ozu as a go-between. There is no question that Hou, as part of his obsession with history and memory, makes the (direct) representation of time the very foundation of his contemplative practice, albeit in some ways that differ from Ozu’s (he is more willing to move the camera, for one thing). (24) But here I am concerned more specifically with the ways in which Hou adheres to what we might call the “ontological” tradition, the school of film practice that, in the words of Philip Lopate, “allow[s] the moment to flower rather than coercing it into plot functions.” (25) Initially brought to bear in Bazin’s writings on Orson Welles, Roberto Rossellini, and Vittorio De Sica, the tradition I’m speaking of has broadened to encompass figures as diverse in their sensibilities as Godard, John Cassavetes, Andrei Tarkovsky, Abbas Kiarostami, and Tsai Ming-liang – in short, those who, to varying purposes, merge fiction and documentary and explore the cinema’s capacity to record an instant or to depict real-time duration. All three sections in Three Times are more flexible in terms of shot length than some of Hou’s previous works. Hsimeng jensheng (The Puppetmaster,1993) and Haonan haonu (Good Men, Good Women,1995) boast average shot lengths of 82 seconds and 106 seconds respectively. (26) But in “A Time for Love,” Hou offers a different feeling of temporality, with occasional jump cuts thrown in to effect a sense of rhythm. What becomes more and more evident is that the duration of the shot (that is, how long the shot lasts) is less crucial for Hou than the duration revealed within and across shots. In this way, Hou departs from the Bazinian view that values continuous time preserved on celluloid (a view that Bazin himself never subscribed to unconditionally (27)) and moves closer to something like Tarkovsky’s concept of “time-pressure” or “time-thrust.” For Tarkovsky, whose craft-inspired theory might be seen as filling a gap between montage and mise en scène positions, “The distinctive time running through the shots makes the rhythm of the picture, and rhythm is not determined by the length of the edited pieces, but by the pressure of time that runs through them.” (28) For Tarkovsky and Hou alike, the task of the filmmaker is not so much to record time in all its unaltered integrity, but to convey a sensation of time in all its spontaneity. Throughout “A Time for Love,” Hou focuses on the fleeting instant, on time in the midst of its dissipation. When Chen and May actually do converse (their exchanges are few and far between), their dialogue revolves around schedules and deadlines – when May gets off work, when Chen has to report back to military service, when the train is due to arrive. Chen’s love letters, written both to May and another pool hall girl before her, further enforce this sense of transitoriness by repeating the phrase “time flies.” This fascination with the fleeting moment registers in stylistic terms. Hou lingers on images of cigarette smoke and rippling ocean waves, images which – far from serving as inserts or cutaways that disclose details and propel the narrative – evoke the slow and steady rhythm of the present-becoming-past. The last scenes of “A Time for Love” further bring to bear Hou’s optics of ephemerality. Chen finally locates May working in a billiard hall in Huwei. “Long time no see!” he tells her after getting her attention. In medium shot with out-of-focus actions passing between them and the camera, they talk sparingly and nervously about their schedules as Chen smokes a cigarette. We then cut abruptly to a medium-long shot of Chen and May enjoying soup together in a restaurant, their faces obstructed somewhat by steam curling upwards from a container in the foreground. On the audio track, rain popping on the window gives way to the film’s second playing of “Rain and Tears,” the 1966 hit by Aphrodite’s Child. In this gesture which “remembers” the song’s prior occurrence, it seems as though Hou wants to trace the interval in which time evaporates and becomes available to the workings of memory and nostalgia. Another abrupt cut takes us to a shot of the couple sprinting across a parking lot under an umbrella. They check the train schedule and determine that they have to wait for a car instead. 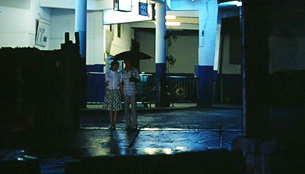 Given its muted but richly saturated color palette, its repetition of a pop song, and its rainy setting, the scene – indeed the whole episode – bears an unmistakable relation to the work of Wong Kar-wai, namely Huayang nianhua (In the Mood for Love, 2000), a film shot mostly by Hou’s regular cinematographer, Mark Lee Ping-bin, when Christopher Doyle was away on another project. The reference to Wong becomes explicit when Hou offers an elegant closeup of the couple’s hands dangling at their sides. But whereas in Wong’s film their hands stay teasingly apart, joining only when they have to go separate ways on their last night together in Hong Kong (a scene traumatically reenacted in 2046 ), in Hou’s rendering the lovers’ hands slowly clasp in a gesture that signals the beginning rather than the dissolution of a relationship. There is another crucial difference here, one that distinguishes Wong’s and Hou’s treatments of temporality. Hou’s performances are slightly more naturalistic and spontaneous, slightly less determined by blocking and other conventions of staging action. Not to say that Wong’s Tony Leung and Maggie Cheung are histrionic – quite the opposite. But as Chang Chen pointed out in a Three Times press conference at Cannes, when acting for Hou one has to “forget the camera” as though one “were in a documentary.” (29) It seems accurate to say, then, that Wong’s lovers-in-the-rain sequences are completely shot through with nostalgia from start to finish, while in Hou’s version there is a more dynamic tension between the transient, real-time unfolding of the moment and its passage into the retroactive temporalities of memory and nostalgia. The middle part of Three Times – “A Time for Freedom” – takes us back to 1911, when Taiwan was in the 17th year of its Japanese occupation, but despite this leap in time several repetitions occur. Most noticeably, Chang Chen and Shu Qi return as the lead performers, with Chang playing Mr. Chang, a dissident scholar in favor of Taiwan’s self-rule, and Shu Qi playing an unnamed courtesan unable to escape her obligations to her brothel. Shot as a silent film with intertitles relating the dialogue – a choice owing to budgetary issues and to the unlikelihood of the actors being able to master the Taiwanese dialect of the period on such short notice – “A Time for Freedom” nevertheless continues Hou’s fascination with the quotidian. As in Flowers of Shanghai, which similarly takes place in a lavishly decorated brothel filmed with low-contrast lighting, recurrent actions such as eating and drinking and grooming inscribe the languid rhythms of the everyday while sublimating the sexual relationship of Mr. Chang and his courtesan. Further, Hou continues to frame thresholds from the inside looking out, but in this case a different set of historical circumstances encroach on the interior, namely the uncertain fate of Taiwan in the negotiations between Japan and China. Just as Chen’s army duties call him away from his interlude with May, these events surrounding Taiwan’s future keep Mr. Chang from spending more than a few days at a time with his lover. Like Chen and May, their conversations revolve around the dates and circumstances of Mr. Chang’s comings and goings. Hou again reinforces this notion of transitoriness aesthetically, using steam from a tea pot and smoke from burning incense to visualize the fleeting moment. Other time-centered techniques include Ozu-inspired still lifes which punctuate transitions between scenes, and slow fade-outs and fade-ins which – instead of suggesting time lapses as per convention – provide momentary breaks from the same fields of action, as if the camera needs to blink from having stared too long. Of course, in vivid contrast to Mr. Chang’s endless arrivals and departures, what remains static in this section is the situation of Shu Qi’s courtesan. Although Mr. Chang arranges the freedom of another courtesan (who is pregnant), he does not do the same for her, as his modernist principles prohibit him from taking a second wife. The section concludes with a long-held shot of Shu Qi’s character seated inside her parlor, crying and tracing her fingers over a letter from Mr. Chang while the muted sounds of a lute, strummed by a courtesan-in-training, play on the audio track. At each step in the narrative, Hou iterates that “A Time for Youth” equals a time without history and memory. It is telling, for instance, that Zheng and Jing – unlike the couples in previous chapters – never speak of approaching dates and deadlines, as such would require them to think too far in advance, to conceive of orders of time beyond the present moment. Every aspect of their lives is completely saturated with technologies of communication and reproducibility – digital cameras, cell phones, text messaging, home recording software, all of which “update” the handwritten letters in the preceding sections and lend the film an additional, electronic space. Yet, as Hou suggests, their relationships are more difficult to maintain, their thoughts and feelings more difficult to know let alone convey. In one scene that takes place in a nightclub, Jing sings onstage in English a song about the need for self-examination, while a handful of men in their early twenties, Zheng included, encircle her and take photos of her performance. Despite their proximity, there is no apparent connection, only emotional distance that increases with each flash. As I hope to have made clear by now, the aesthetic of Hou Hsiao-hsien is no less committed to exploring the cinematograph as a register of “embalm[ed] time,” to borrow Bazin’s memorable phrase. (34) In the most basic sense, Hou’s reliance on protracted shots and dense mise en scène is rather Bazinian in its emphasis on allowing actions to unfold in real time and thus in the absence of dialectical edits which might impose meaning onto innately ambiguous images and disturb the viewer’s access to profilmic reality. My point in pairing Hou with Bazin is not to downplay the Chineseness of his style, as Hou himself might claim since he has long cited his desire to discover a “particularly Chinese” method of shooting and expressing emotion. (35) Nor do I wish to ignore the fact that Hou seems to have formulated his trademark approach without the film-historical knowledge shared by most of the other New Taiwan Cinema figures. As the Bordwellian scholar James Udden is quick to point out, when Hou was asked by an interviewer in 1989 how much his long-take aesthetic was influenced by the writings of Bazin, Hou responded sincerely, “Who’s Bazin?” (36) But whether or not Hou’s practice is knowingly Bazinian is not a matter I care to explore. After all, to stress how the director’s penchant for long takes and long lenses originated is to miss how that penchant has developed and become more self-conscious in the past two decades, no longer subduing poor performances but supporting a philosophy of history. Moreover, to reduce Hou’s practice to cultural or industrial determinants runs the risk of missing what it bodes for cinema at this key moment in the history of imaging. Hou’s optics of ephemerality call attention to precisely the aspects of the medium that the digital purportedly threatens to extinguish – the ability to register durational time as well as the instantaneous, to ensure the readability of the contingent. This is not to say that Hou simply documents the real, letting the camera record the profilmic automatically and objectively. As Bazin once said of Rossellini, Hou’s practice offers us “documentary reality plus something else.” (37) For Hou, this “something else” is a knack for merging the ontological tradition of filmmaking with memory work. On the one hand, he lets actions unfold within an unbroken frame, capturing time as it evaporates, the instant as it recedes into the past. And yet, on the other hand, Hou seeks to register the interval within which time avails itself to the workings of nostalgia and memory. For an impressively detailed account of Taiwan’s film industry in the years leading up to the New Cinema movement, see Yingjin Zhang, Chinese National Cinema (New York: Routledge, 2004), 113-149. For a brief summary of this school of filmmakers, see Tony Rayns, “Countdown: Steps towards Taiwan’s ‘New Wave,’” in Taiwanese Cinema, 1982-2002: From New Wave to Independent (Pusan: Pusan International Film Festival, 2002), 20-29. See Bérénice Reynaud’s monograph A City of Sadness (London: British Film Institute, 2002). Michael Curtin, “The Future of Chinese Cinema: Some Lessons from Hong Kong and Taiwan,” in Chinese Media, Global Contexts, ed. Chin-Chuan Lee (London: Routledge, 2003), 245. For an account of this controversy, see the website devoted to City of Sadness created by Yeh Yueh-yu and Abé Marcus Nornes. Accessed February 24, 2006. For a discussion of Hou’s reception at home and abroad, see Yeh Yueh-yu, “The Politics and Poetic of Hou Hsiao-hsien’s Films,” Post Script 20, no. 2/3 (Winter/Spring 2001): 61-76. David Bordwell, Figures Traced in Light: On Cinematic Staging (Berkeley: University of California Press, 2005), 201. Bordwell’s earliest, most explicit articulation of this approach appears in “Historical Poetics of Cinema,” in The Cinematic Text: Methods and Approaches, ed. R. Barton Palmer (New York: AMS, 1989), 369-398. Bordwell, Figures Traced in Light, 189, 201. Thomas Elsaesser, “The New New Hollywood: Cinema Beyond Distance and Proximity,” in Moving Images, Culture, and the Mind, ed. Ib Bondebjerg (Luton: Luton University Press, 2000), 187-203; Dudley Andrew, “A Preface to Disputation,” in The Image in Dispute: Art and Cinema in the Age of Photography, ed. Dudley Andrew and Sally Shafto (Austin: University of Texas Press, 1997), vii-xiv; Raymond Bellour, “The Double Helix,” in Timothy Druckrey, ed. Electronic Culture: Technology and Visual Representation (New York: Aperture, 1996), 173-199; Philip Rosen, Change Mummified: Cinema, Historicity, Theory (Minneapolis: University of Minnesota Press, 2001); Mary Ann Doane, The Emergence of Cinematic Time: Modernity, Contingency, the Archive (Cambridge, Mass. : Harvard University Press, 2002); Paul Willemen, “Reflections on Digital Imagery: Of Mice and Men,” in New Screen Media: Cinema/Art/Narrative, ed. Martin Reiser and Andrea Zapp (London: British Film Institute, 2002), 13-26; Laura Mulvey, Death 24x a Second: Stillness and the Moving Image (London: Reaktion, 2006). Doane, The Emergence of Cinematic Time, 228. Paul Willemen, “Through the Glass Darkly: Cinephilia Reconsidered,” in Looks and Frictions: Essays in Cultural Studies and Film Theory (London: British Film Institute, 1994), 227. Kent Jones, “Cinema with a Roof Over Its Head,” Film Comment 35, no. 5 (1999): 49. Hou Hsiao-hsien, quoted in press kit available at www.sinomovie.com/ThreeTimes. Accessed February 17, 2006. Philip Lopate, “A Deeper Shot: Introducing Hou Hsiao-hsien,” Cinema Scope 3 (2000): 27. Bordwell, Figures Traced in Light, 225-226. Lopate, “A Deeper Shot,” 28-29. This is Joan Hawkins’ argument in Cutting Edge: Art-Horror and the Horrific Avant-garde (Minneapolis: University of Minnesota Press, 2000), 174-184. The initial reception of Warhol’s early films by such critics as Parker Tyler and Peter Gidal was that such an uncompromising attention to nuances of time and movement demands a heightened sense of perception on the part of the viewer. Bordwell, Figures Traced in Light, 227. See Steve Neale, “Widescreen Composition in the Age of Television,” in Contemporary Hollywood Cinema, ed. Steve Neale and Murray Smith (New York: Routledge, 1998), 130-141. David Cook, A History of Narrative Film, 4th ed. (New York: W.W. Norton & Co., 2004), 746-749. Gilles Deleuze, Cinema 2: The Time-Image, trans. Hugh Tomlinson and Robert Galeta (Minneapolis: University of Minnesota Press, 1989), 1-13. For an interesting comparison of Hou and Ozu, one that draws on Eastern artistic traditions, see Reynaud, City of Sadness, 71-83. Lopate, “A Deeper Shot,” 29. I have borrowed these statistics from Bordwell, Figures Traced in Light, 217. While even the critics and eventual New Wavists at Cahiers du cinéma regarded Bazin’s disapproval of montage as categorical – hence Eric Rohmer’s reference to Bazin’s “objectivity axiom” – some of his writings exhibit an openness to the practice and see it as a way to maintain the essence of reality even more effectively than the long take. See for instance his article “Death Every Afternoon” , trans. Mark A. Cohen, in Rites of Realism: Essays on Corporeal Cinema, ed. Ivone Margulies (Durham: Duke University Press, 2003), 27-31. Andrei Tarkovsky, Sculpting in Time: Reflections on the Cinema, trans. Kitty Hunter-Blair (Austin: University of Texas Press, 1986), 117. Chang Chen, quoted in press conference available online here. Accessed February 24, 2006. See Fredric Jameson, “Remapping Taipei,” in The Geopolitical Aesthetic: Cinema and Space in the World System (Bloomington: Indiana University Press, 1992), 114-157. Yomi Braester, “If We Could Remember Everything, We Would Be Able to Fly: Taipei’s Cinematic Poetics of Demolition,” Modern Chinese Literature and Culture 15, no. 1 (Spring 2003): 29-57. My reading here owes in part to Ban Wang’s remarks on Hou’s similarly-themed Millennium Mambo in “Black Holes of Globalization: Critique of the New Millennium in Taiwan Cinema,” Modern Chinese Literature and Culture 15, no. 1 (Spring 2003): 91-117. André Bazin, “The Ontology of the Photographic Image,” in What is Cinema? Vol. I, trans. Hugh Gray (Berkeley: University of California Press, 1967), 14. Hou, quoted in Rayns, “Countdown,” 24. James Udden, “Taiwanese Popular Cinema and the Strange Apprenticeship of Hou Hsiao-hsien,” Modern Chinese Literature and Culture 15, no. 1 (Spring 2003): 121. André Bazin, “Defense of Rossellini” , trans. Geoffrey-Nowell Smith, in Roberto Rossellini: Magician of the Real, ed. David Forgacs, Sarah Lutton, and Geoffrey Nowell-Smith (London: British Film Institute, 2000), 160. Charles R. Warner is a PhD student in the Cultural and Critical Studies program at the University of Pittsburgh. Recent publications include "Shocking Histoire(s): Godard, Surrealism, and Historical Montage," in Quarterly Review of Film and Video, forthcoming 2006.